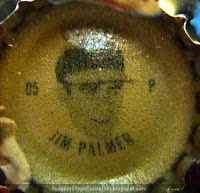 Today's profile marks my 4th 1967 Coke cap and 2nd Hall-of-Fame pitcher, following the Dodger set's extremely young Don Sutton. In 1991, the year after his HOF induction, Palmer traveled to Orioles' spring training and worked on a big-league comeback. He pitched just a pair of "live" innings--giving up 5 hits and 2 runs--before electing to stay retired. 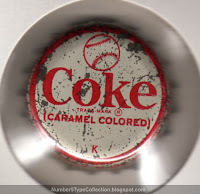 Fake / Reprints: I'm pretty sure no one's faked a Coke cap. Let me know if you've seen otherwise!